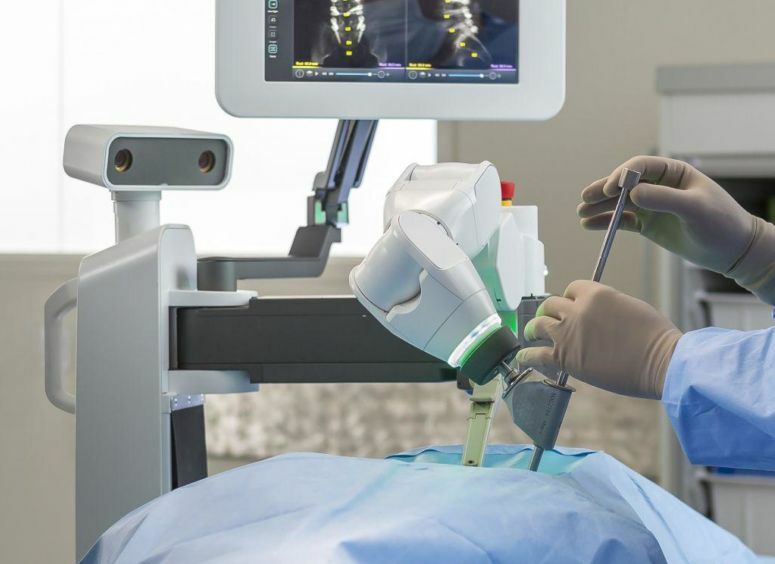 Robotic spine surgery, also commonly known as robotic guidance or robotic-assisted surgery, is setting a new standard for safety and accuracy in the operating room and Atlantic Brain and Spine is proud to championing this new and exciting minimally invasive technology. Robotic spine surgery is a minimally invasive, surgical process that allows our neurosurgeons at Atlantic Brain and Spine to access mechanical precision not normally possible for a human for accurate placement of screws and interbody devices during spine surgery. For many patients, the idea of spine surgery can be intimidating and scary. There are often questions of safety, accuracy and recovery times as they try to figure out which option is best for their specific condition. 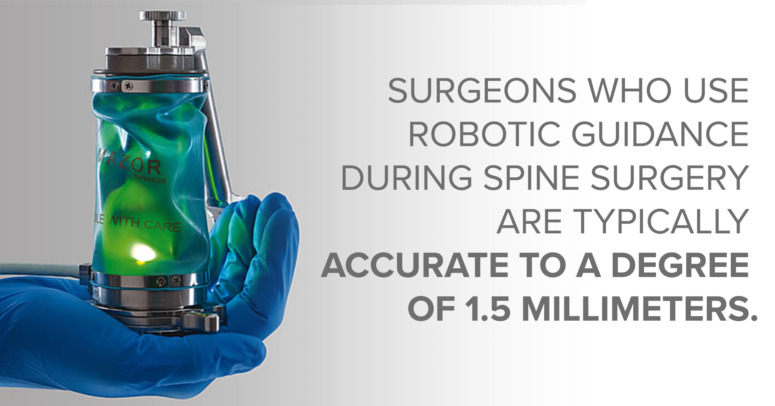 Fortunately, robotic spine surgery is on the cutting edge of technology in the operating room and provides patients with incredible accuracy, shorter recovery times and, most importantly, an increased level of safety. Robotic spine surgery offers powerful, cutting-edge benefits for patients who are suffering from a debilitating spinal condition including a level of implant accuracy unattainable by the human hand, less blood loss, infection and complication risk during surgery and shorter recovery times after the operation is completed. Robotic spine surgery requires careful planning from our neurosurgeons to ensure that the operation is specifically tailored to your specific needs, condition and body type. This is why, our board-certified surgeons will take a 3D scan of your spine before you ever enter the operating room. This allows them to plan out the operation beforehand and program the specific location of every necessary implant into the robotic guidance system. During the procedure, the neurosurgeon will take another scan of your spine and perform a synchronization of the two scans to match up the intraoperative anatomy with the preoperative blueprint. Once this is completed, the robotic system will use mechanical guidance to help the physician place implants and interbody devices with incredible precision. As a matter of fact, surgeons who use robotic guidance during spine surgery are typically accurate to a degree of 1.5 millimeters.2 For scale, that’s a size slightly smaller than the width of quarter. This accuracy is critically important for two major reasons, the first is that a screw misplaced by even a couple of millimeters can cause continued back pain, slower recovery and even repeat surgeries. From a patient’s standpoint, this is simply unacceptable. The second reason that accuracy is critical in spine surgery is because surgeons are often operating around some of the most complex and critical components in the body including major arteries and the central nervous system. There is simply no room for error or a lack of accuracy when dealing with such vital systems. Shorter recovery times are possible thanks to the minimally invasive approach that is taken during robotic spine surgery. Minimally invasive spine surgery rose to the forefront of spine care when surgeons realized that the traditional, “open surgery” technique affected more of the patient’s anatomy than was necessary and led to several major and unnecessary drawbacks for patients including increased blood loss, longer recovery times, increased pain during recovery and a higher risk of infection after the operation. Because surgeons disrupt less of the anatomy when they perform minimally invasive surgery, patients typically experience less complications during and after surgery and are able to recover more quickly from the operation. The safety benefits of robotic spine surgery come primarily from the minimally invasive approach that it requires. Surgeons don’t need to open up as much of the back to access the spine, thus there is less chance for blood loss, infections and other operative complications. Additionally, surgeons are required to meticulously plan their surgeries before a patient ever enters the operating room and the robotic-guidance system allows them to accurately place every screw and device precisely where it needs to be, the first time; helping avoid repeat surgeries. The surgeon creates a unique, 3D preoperative blueprint of the procedure using a CT scan that is tailored to the patient’s specific needs. This allows the surgeon to see what’s going on without necessitating a wide incision down the spine. Next, the surgeon mounts the robotic platform onto the patient’s spine. This ensures that precision and accuracy are maintained, even if the patient moves during the operation. After mounting the platform to the spine, a 3D synchronization of the spine is completed and then matches up the intraoperative anatomy with the preoperative blueprint. This allows the Robotic Guidance system to operate with accuracy unattainable by a human hand. Finally, the surgeon is ready to operate on the affected part of the patient’s spine. Using the Robotic Guidance system, they are able perform the procedure with remarkable speed and accuracy, which significantly reduces complications during and after surgery. For more detailed information regarding Robotic-Assisted Spine Surgery, explore the Robotic Spine Surgery: How It Works page. Am I A Candidate for Robotic Spine Surgery? If you are suffering from a painful spinal condition that has not been corrected through conservative treatments like physical therapy or medication or your spine specialist has recommended that you undergo spine surgery to address your back pain, you might be a candidate for robotic spine surgery. Our neurosurgeons can use robotic-guidance technology to treat a wide variety of spinal issues including degenerative disc disease, herniated discs, scoliosis and spondylolisthesis. If you’re interested in learning more about robotic spine surgery, please get in touch with our office. 1 Devito DP, KaplanL, Dietl R, et al. Clinical acceptance and accuracy assessment of spinal implants guided with the SpineAssist surgical robot; retrospective study. Spine.2010;35(24):2109-2115. 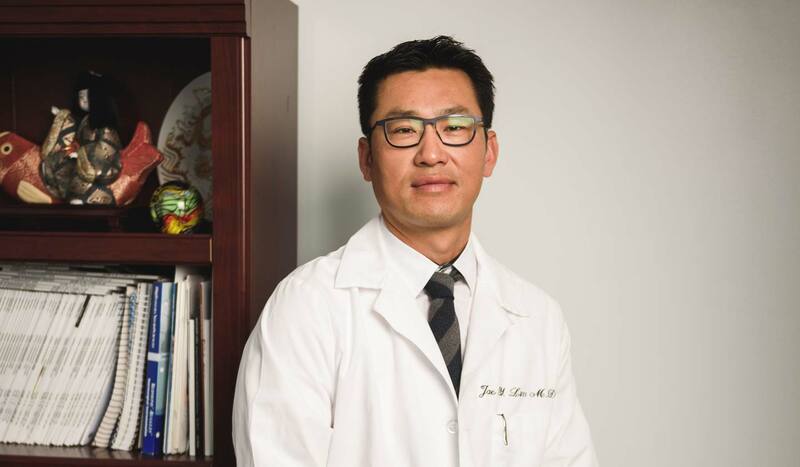 Dr. Lim is one of only four surgeons in Northern Virginia to utilize robotic surgery techniques for complex back surgery. 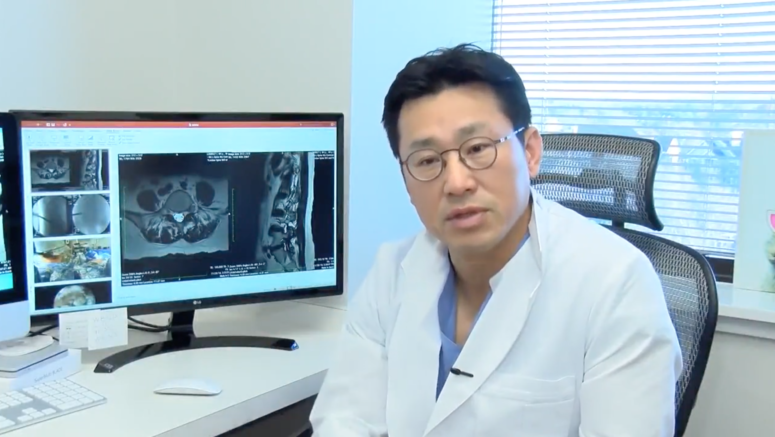 He was recently featured on NBC Washington’s 4 Your Health segment, highlighting the benefits of robotic spine surgery to correct painful and debilitating back issues. Prior to meeting Dr. Lim, I was seeing a different surgeon who told me I could wait a week before having surgery performed. But when Dr. Lim reviewed my MRI he could see that my spinal cord was being pinched severely. He immediately admitted me to the hospital and performed emergency surgery on me. Dr. Lim really saved me from being paralyzed. I couldn’t be more pleased with the way he has taken care of me.